On the Solemnity of the Blessed Apostles Peter and Paul we were treated to this splendid hymn at First Vespers. It was sheer delight to attend graduation exercises at my old alma mater, Saint Agnes High School in St. Paul, Minnesota. St. Agnes was the first co-educational Catholic high school in the city of St. Paul and in the Twin Cities (the school comprises of grades K-12). The current campus, dedicated in 1940 (with an addition in 1953), holds many memories for myself and so many others. When the new convent was dedicated in 1953, it was constructed to hold 54 nuns! Today the school is a powerhouse of Catholic education thanks to a very fine pastor, faculty and staff. Many giants have walked the hallways of St. Agnes and laid the foundation for greatness. The same grey stone tower with green clock rises high into the sky, a city landmark calling students to St. Agnes, venerable and dignified in its verdigris pinnacle, surmounted with a golden cross. "Several thousand men, women, and children were present at the dedication of the new grade and high school of St. Agnes parish. Many German Catholics were also present for the annual St. Boniface celebration, which, though usually held at the Cathedral, was held at St. Agnes. These German Catholics came from many communities; martially they kept step to the tempo of the St. Agnes drum and bugle corps, organized and promoted by the assistant pastor, Father Nicholas Schmitt. 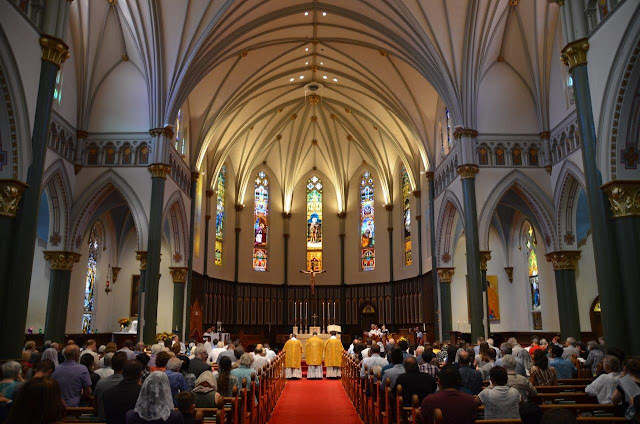 The most Reverend Archbishop, visiting pastors from parishes throughout the city, and civic officials heard Reverend Lambert Hoffman deliver the sermon for the occasion. After the Archbishop had blessed the school and had hung the first crucifix in one of the classrooms, the group moved into the dining hall in the new school. Mr. Michael Ettel, the toastmaster, introduced the speakers at the banquet: the most Reverent Archbishop Murray, Father Gruden, Mayor McDonough, and Mr. Joseph Matt. Then the St. Boniface celebration began with a parade from the western section to the church. At the church German hymns were sung. 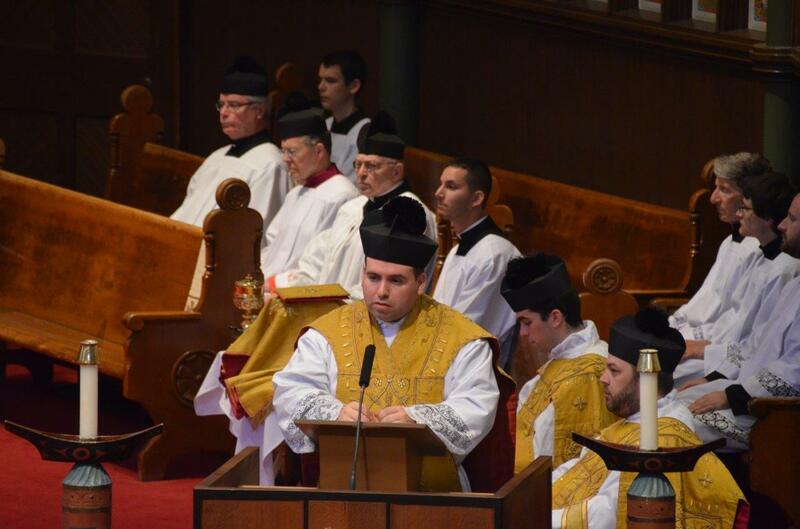 Archbishop Murray preached the sermon for the occasion. His Excellency called attention to the dangers confronting the entire world because of the catastrophe in Europe. Catholics must erect moral barriers to stem the vices of impending social upheavals. German Catholics can learn much from the life of St. Boniface. At the civic program in the auditorium over one thousand persons listened to the speakers of the day: Father Gruden, Messrs. Matt, Ettel, and Aretz." These treasures are as rare as hens teeth. I would like to see this version reprinted. This copy yours truly picked up at Loome Theological Booksellers in Stillwater, Minnesota. A kind friend just gave this to us for our garden. The scent is exquisite! A great cause to support and an indispensable light to help the Christians in the Holy Land. 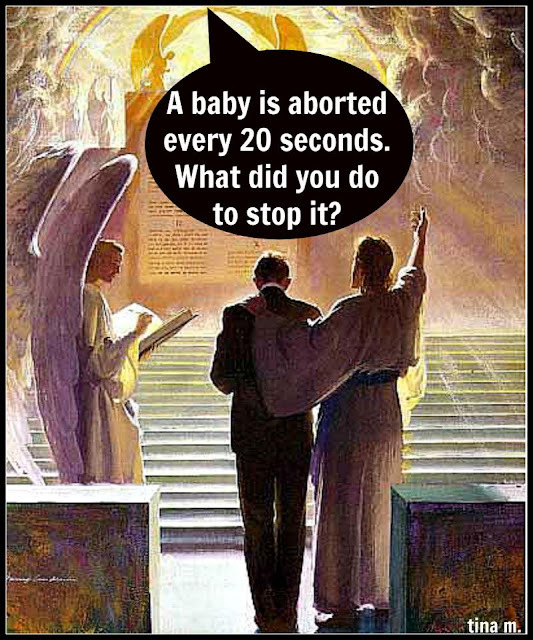 What Are You Doing for the Pro-Life Movement? Stromberg, the Rev. James S. Age 90, of St. Paul, passed away June 19, 2017 at the Little Sisters of the Poor in St. Paul, MN. Born in Chippewa Falls, Wisc. to parents Louis J. and Anne Stark Strom-berg, he grew up in St. Paul, graduating from Cretin High School in 1945. He then entered the US Navy, proudly serving for 1 1/2 yrs. He earned his degree from the College of St. Thomas, and went on to earn a Ph.D. in Philosophy from The University of Laval in Quebec, Canada. He was ordained a priest for the Archdiocese of St. Paul & Minneapolis on February 17, 1957. Father then taught philosophy at St. Thomas from 1957-2002 and was Chair of the department for some of those years. In retirement he served the Church of the Holy Family in St. Louis Park and various other parishes. He is survived by cousins: Robert L. Johnson, San Antonio, TX; Sue Turlington, Rochester, MN; Marilyn (Carl) Simmons, Mendota Heights, MN and Maureen (Jay) Gellermen, Brighton, Michigan, and other relatives and friends. An all-night vigil will be held beginning at 7:00 PM Friday, June 23 at the Church of the Holy Family, 5900 W. Lake St., St. Louis Park, MN 55416 with a Mass of Christian Burial at 10:00 AM on Saturday, June 24. Interment at Resurrection Cemetery, Mendota Heights, MN. My friend ordered this from the St. Bede Studio. 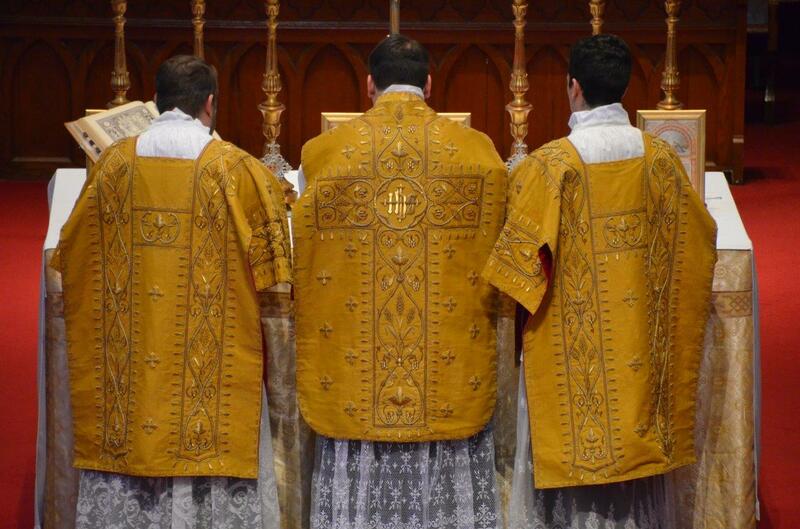 He and his parishioners are very satisfied with the fabric and color. I find their creations are of the highest quality. I recommend you contact the St. Bede Studio to design and create a nice Gothic vestment set for your parish. Its a great way to express your gratitude to your priest. 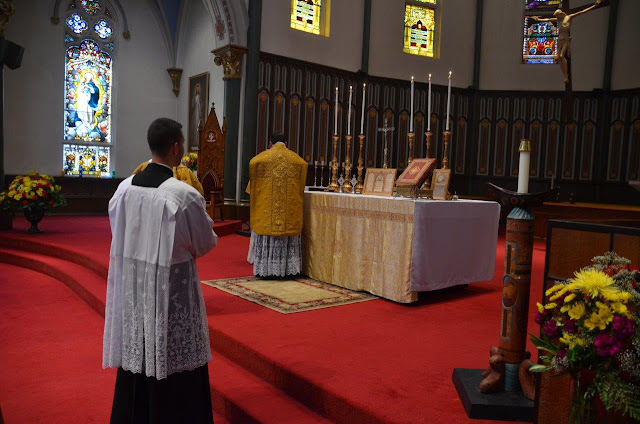 Vestments make great gifts that can be bequeathed to your parish sacristy forever, adding artistic merit and solemnity to your parish ceremonies for generations. 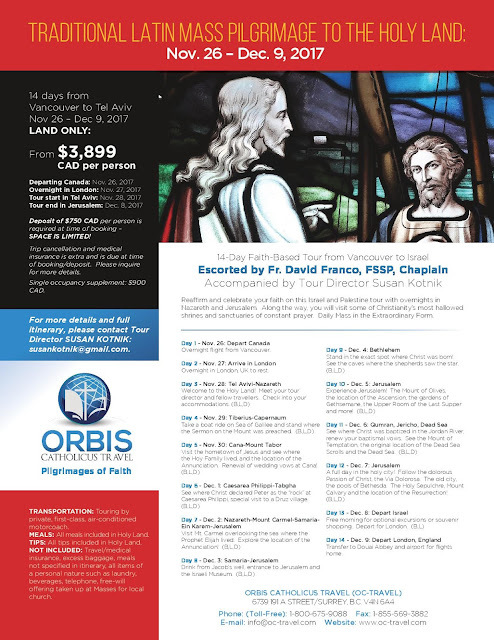 Announcing...our 2nd FSSP Holy Land pilgrimage this year! Don't miss out on your chance to see it all. 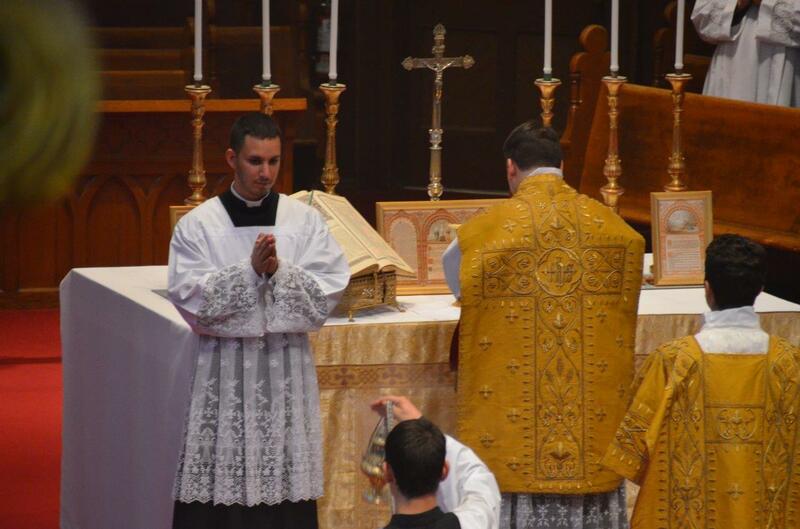 Daily TLM at the holy sites. Deadline for registration: August 10. "Congratulationes omnibus qui nomine Pauli vocantur." The location on the Sea of Galilee where Christ reaffirmed Peter as chief among the apostles. There has been a church on this spot for nearly 2,000 years. This site was called "the Place of the Coals." This is because Jesus made a charcoal fire here to prepare a meal for His Apostles, after He rose from the dead. On the ground are massive heart shaped stones, first mentioned in the year 808. The stones were placed along the shore to commemorate the Twelve Apostles. There is a famous photo of Paul VI visiting here in 1964, kissing the stone inside the church and standing on the rocks on the beach. Paul is thought to be the first pope to visit here since Peter. A perfect place to hear a sermon by a priest of the FSSP - the first religious order in the Church, it should be noted, named after the Blessed Apostle Peter. The lovely little chapel on the beach was constructed in 1933 in celebration of the Holy Year. The chapel and grounds are under the care of the Franciscans. Inside the chapel is the Mensa Christi - this is the projection of limestone rock in front of the present altar which is venerated as the spot where Christ after His Resurrection laid out a breakfast of bread and fish for His Apostles, telling Peter: "Feed my sheep" after the miraculous catch (cf. John 21:1-24). The place in Tabgha, on the Sea of Galilee, where Christ appeared after His death and reinstated Peter as chief among the apostles. To have Christ among us in the Eucharist is a great honor to walk with Him again amid the shores of the Sea of Galilee, where He appeared after His death and resurrection. "Life with God is not immunity from difficulties, but peace in difficulties." Popes have eaten off these plates. When Roman Pontiffs visit Bethlehem, they eat lunch at the Franciscan guesthouse, Casa Nova, located next to the Basilica of the Nativity of Our Lord in Bethlehem. Soaring skyward with its bold array of colored brick, stone and slate, the Cathedral of St. Andrew in Victoria displays the confident spirituality that characterizes the best religious architecture in Canada. 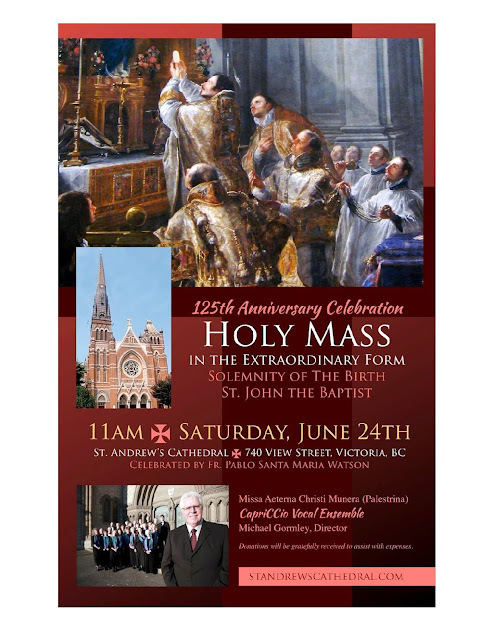 The High Victorian Gothic style, an inspiration to generations of Canadians, was a fitting backdrop to sung Mass in the Classical rite on Saturday, June 24, a part of the Cathedral's 125 year celebration and Canada's 150 years. Designed in the 1880s by Perrault and Mesnard of Montreal, St. Andrew’s was inspired by the medieval cathedrals of Europe, whose emphatic verticality and picturesque asymmetry greatly appealed to late nineteenth century architectural taste. 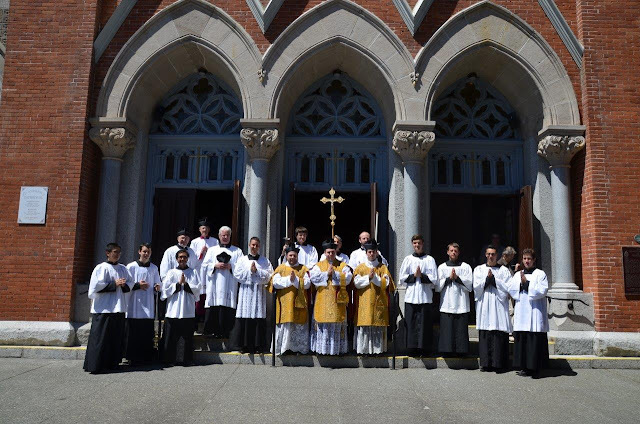 The port city of Victoria, resting on the edge of the North American continent, has the unique distinction of being one of the very last Episcopal Sees having been headed by a living Council Father. 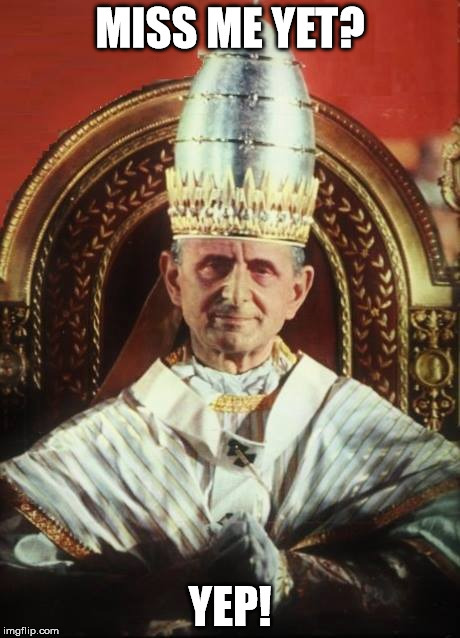 Vatican Vatican Council II (1962-1965) was attended by Bishop Remi de Roo, who was appointed Bishop of the Diocese of Victoria in 1962 with a Vatican letter that began with the words, "Gaudio ex toto corde" ("I rejoice with all my heart"). 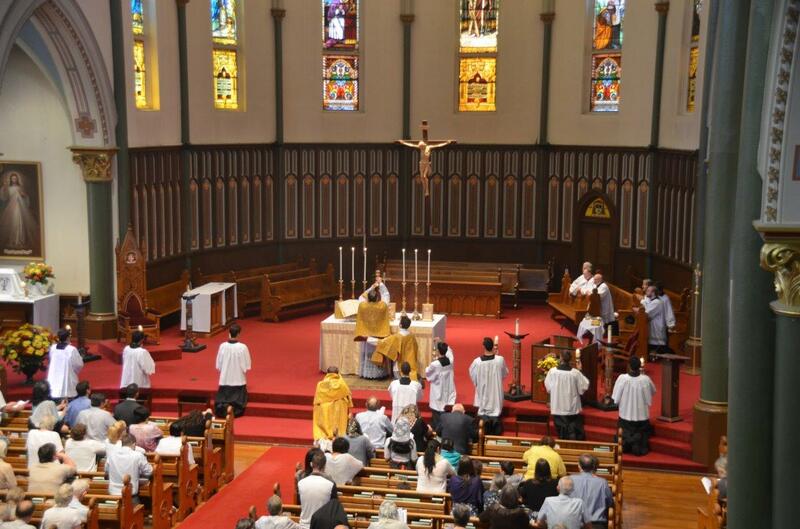 For many of the participants of the packed church, it was their first experience of sung Mass in Latin. One young participant remarked: "This was my first time hearing Gregorian chant. I am an illiterate in the worship of the Church. The super-terrestrial, meditative and other-wordly aspects of the ceremony were a touch of heaven. Thank you to all!" Another exclaimed: "What a great way to renew culture! A big defect in our age is a lack of reverence or even an experience of the sacred." 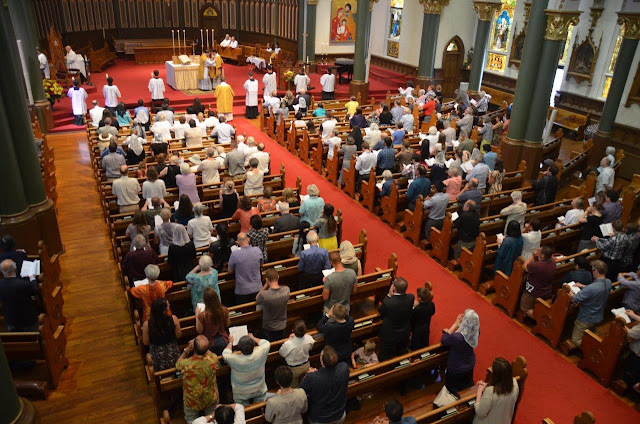 Another visiting musician remarked: "The Roman Church possesses a mature Christian musical culture, the core of which is the Roman rite sung in the Latin language. The choir was terrific!" 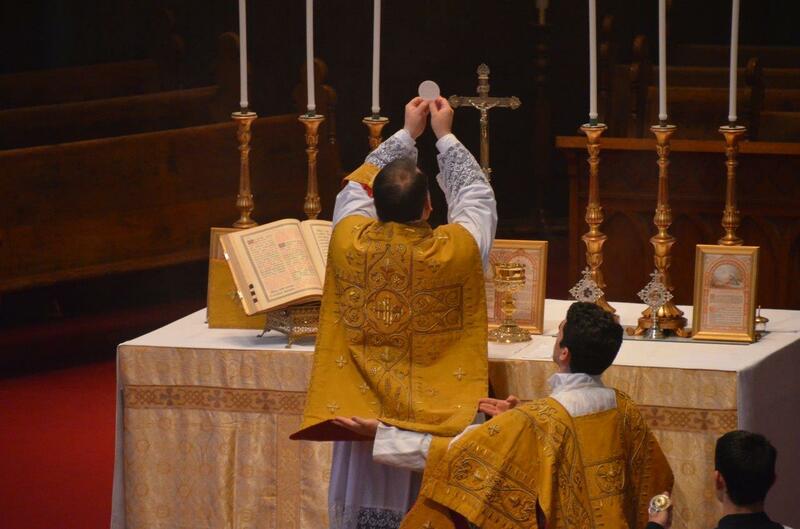 Fifty years after the introduction of vernacular in the Roman liturgy, the question of the use of Latin in the liturgy is being judged in a different light by a new generation of canonists reading the original documents of Vatican II, the official text being in Latin. 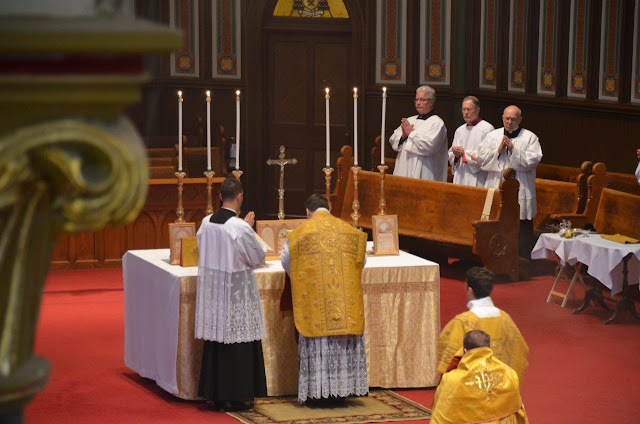 According to the will of the Council itself, Article 36, #1 of the Constitution on the Sacred Liturgy, this principle is formulated: "Particular law remaining in force, the use of the Latin language is to be preserved in the Latin rites." This sentence has imposed a command to preserve the Latin language in the liturgy. 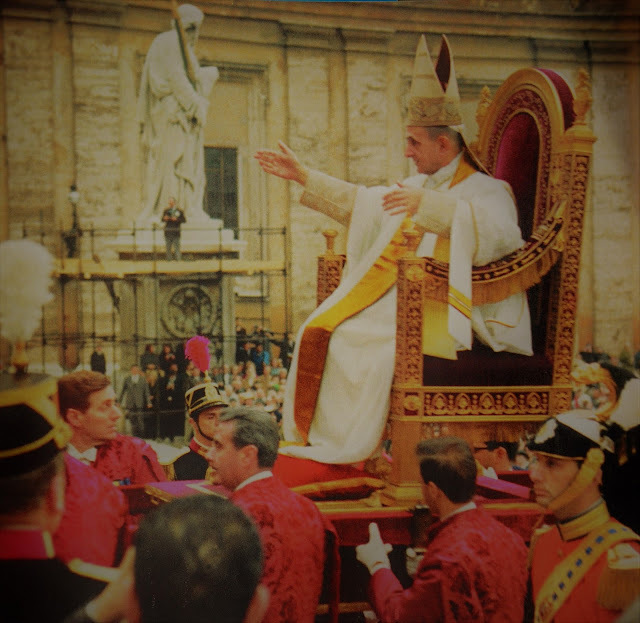 In contrast to various translations produced under certain auspices at the time of the Council, it must be observed that the official Vatican text of the document employs the subjunctive servetur and therefore expresses a command, not merely a recommendation. My dear friend Arne Bryant has passed. He was a saint who worked very hard to keep our land baptized. The organization which he founded, Prayer Canada, does a lot of good to encourage people to get praying for government. May the Lord reward him abundantly! For years I have seen Arne at religious and pro-life events. Until the end, he always drove himself. He was very tall and his passion was the Holy Bible. Losing his wife was tough, although he said she did suffer a lot in her final illness. When I first met Arne, he said he was born in 1918. Surprised, I said: "In other words, you lived through two world wars and survived to tell about it!" His reply was simple: "Yep!" When he gave me his autobiography last year, Arne wrote me a lovely message as a dedica. I cherish these words of encouragement and consolation. May we be inspired by these great warriors for culture who have gone before us. They are titans in a dark forest. Eternal rest! In your charity, pray for the repose of the soul of Arne. And may he pray for us! We will be there, carrying your prayer intentions. If you find yourself on Vancouver Island, do join us! A great man has passed before us. In your charity kindly offer a prayer for the repose of the soul of our beloved professor of ethics, Rev. Dr. James Stromberg, PhD. He dedicated his life to Catholic education at the College of St. Thomas/University of St. Thomas in Saint Paul, Minnesota. Fr. Stromberg was a Catholic philosopher from the old school, a graduate of Laval University in Quebec during its storied days. He was part of a corps of really fine priests who in the 1950s Archbishop Murray and Archbishop Brady saw fit to assign to live and work among the young Catholic men of the College of St. Thomas and St. Thomas Military Academy. Countless students were indebted to him over the years. He inspired many of us. I can still see him on his way to the clergy dining room in Murray Hall where the priests took their meals. I was there earlier this summer only to find that whole area has been turned into classroom space. There were so many fine priests at St. Thomas in those days. They lived on campus, heard confessions, celebrated early Mass in the chapel (the chapel celebrates 100 years this year). Their presence was indispensable. Each morning the sacristy was full of them. Their names are etched into eternal glory: Mons. Schuler, Mons. Lavin, Mons. Probst, Mons. DuLac, Mons. Flynn, Mons. Shannon and many others. All these years later that entire culture has been removed from UST which is a major loss to campus life and Catholic identity. The last surviving member is our beloved Fr. George Welzbacher, now in retirement. For years Fr. Stromberg was my confessor at Holy Family parish where he was a weekend assistant. When I would drive by and see his Buick parked along side of the church, I would enter for confession. A brilliant philosopher and a saintly confessor, he adored St. Thomas Aquinas. A true servant, he was good at being a priest. Fr. Stromberg graduated from St. Thomas in 1950 and was chair of the Philosophy Department from 1979 to 1984. From Aristotle he taught that happiness is a rational operation according to virtue in a complete lifetime, a truth which he spent his whole ethics class working up to. Students were introduced by Fr. Stromberg to many literary treasures, including Veatch's Rational Man as well as works by Avery Cardinal Dulles, including this one: http://www.catholicsocialscientists.org/CSSR/Archival/1999/1999_109.pdf. B.K. Dolan, a Michigan student who studied under Fr. Stromberg in the 1990s reminisces of a classroom discussion: "I remember how he told a story of how he went to some wealthy friend's house. Fr. Stromberg was left alone. He saw something odd on the mantle over the fire place. He walked over to take a look. It was a Coca-Cola can. Why would a Coca-Cola can just be sitting on this very wealthy friend's mantle? He reached out for it and as he did his friend rounded the corner and yelled at Fr. Stromberg. 'Don't touch that!' It was a can that Andy Warhol had designed. — He went on to explain beauty and that the end of art was beauty. Contemporary art was about the artist, and not about beauty being an end in itself. This is how I remember it at least." Returning from Jerusalem to North America, I attended Holy Mass at the venerable Austro-Hungarian parish church of St. Agnes in Saint Paul, Minnesota, USA. Sitting in the pews, looking up at the scenes from the life of Christ depicted in the stained glass windows from Munich, I was deeply moved to contemplate the images and admire the artistry, with such vivid pictures in my mind having just returned from visiting these holy sites. God bless the Austro-Hungarian Empire and the Catholic civilization which it nurtured. This direct link with the Holy City of Jerusalem is fitting of such a magnificent Catholic Empire. A wonderful place to stay while on pilgrimage in the Holy City. The rector is a wonderful priest who I hope someday soon will be consecrated bishop. The small, but enchanting imperial chapel is the perfect place to pray in a busy city like Jerusalem.